Microsoft has just announced the Azure mobile app, available for iOS and Android. Check out the ins and out of the new app. This week at the Build Conference, Microsoft announced the Azure Mobile app for iOS and Android (with a UWP app to come soon). 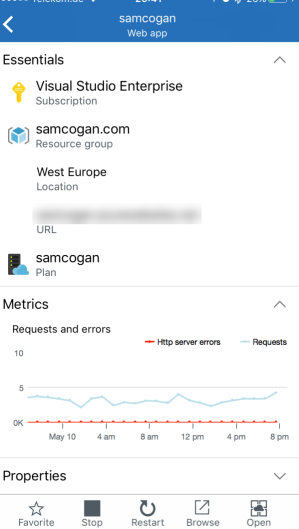 I've had access to this app for a while during the preview and whilst it's never going to replace the web portal for the majority of Azure work and has fairly limited functionality at the minute, it does provide a handy tool for times you need to make a change on the go or just need to check a setting or view some stats. The app is still showing a preview badge, and the released version is 0.3 so it's fair to say it is still in Beta. 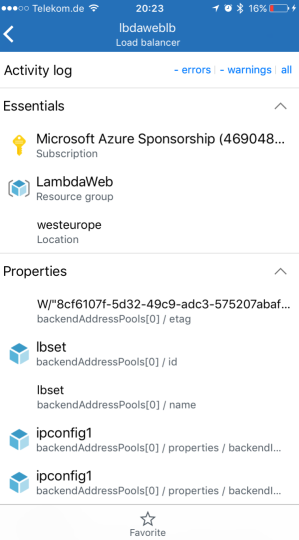 Once you have the app installed, logging into your account is a pretty similar experience to the portal; it uses your Azure AD or Live account as normal, and any 2-factor auth you have setup is used as well. Once you're logged in you can open the hamburger menu on the left and select the Tenant and Subscription you want to display. 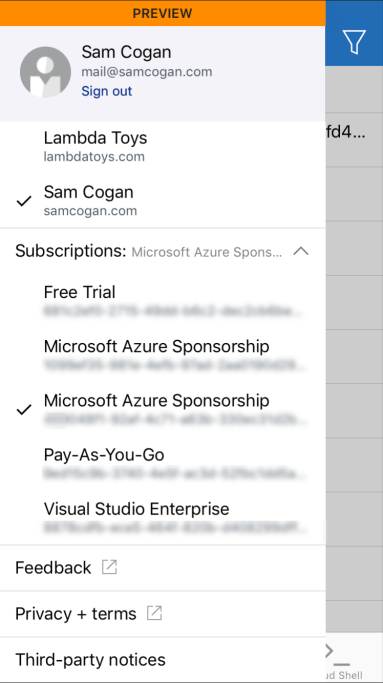 Currently, it only lets you select a single subscription at once. Once you select a subscription, you'll then see a list of all resources in your subscription- which, to be honest, isn't a terribly useful view. To better organize your resources, you can click on the filter icon on the top right and filter by resource type. I find the most useful view is to filter by resource group. Let's take a look at some of the resources that do have more functionality. When you select a virtual machine you are presented with some basic information about the VM, such as size, OS type, etc. 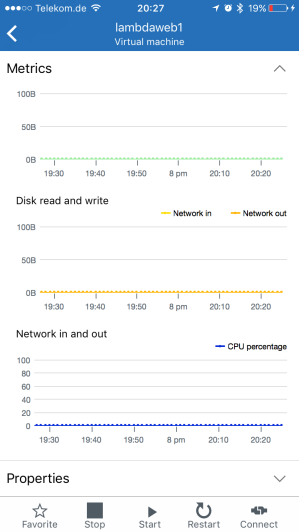 You are also provided with some basic metrics from the VM, for CPU and Disk throughput. You are also presented with options at the bottom to start, stop, and restart the machine. 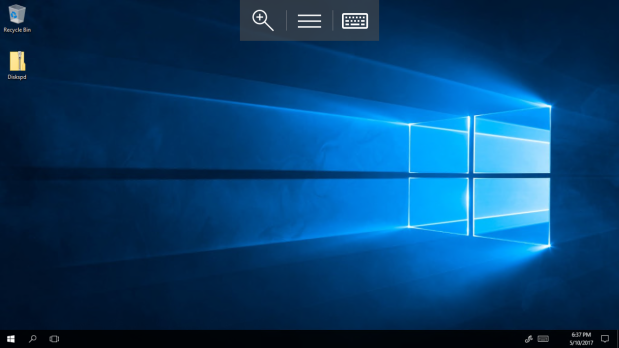 You also have the option to connect to the machine, if you click on this it launches the MS RDP app with the details of the machine you want to connect to, assuming you have it installed. One thing I would really like to see added is the ability to resize the VM. Storage account operations are limited to retrieving basic data about the account and some metrics on blobs, tables, and queues. 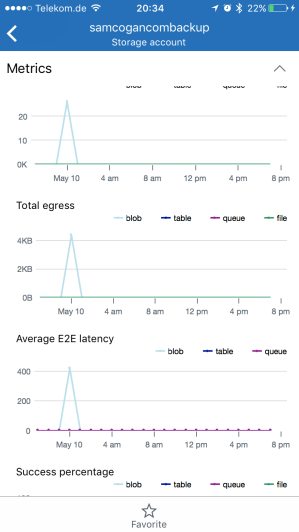 Again, web apps get some basic data and metrics. They also get some controls to stop, start, and restart the app, launch the app in the browser, and also open the web app in App Service Companion app, if you have it. 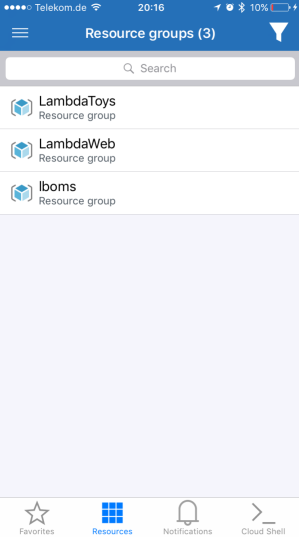 Every resource has an option to view any activity log messages, and also gives you a count of errors and warnings. 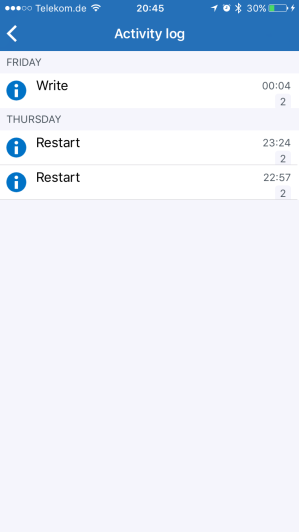 The app also includes a notifications tab, that will show you any messages that you would normally see in the notification area of the portal. 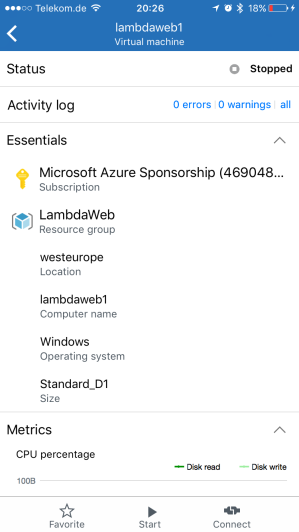 In the latest version of the app I have the Cloud Shell tab just says coming soon, but the preview of this shell was also announced at build and I expect it to roll out to the app soon. With this, you will be able to run a batch and (eventually) a PowerShell interface in the app, as well as online, that you can run commands against Azure from. This shell will remember your history and preferences across devices. 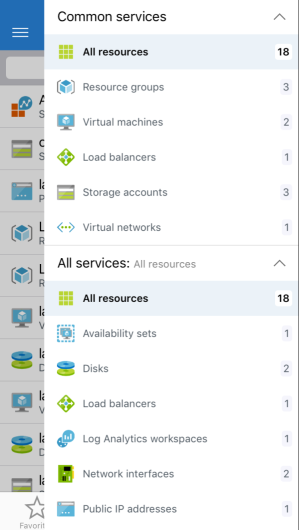 Overall, the Azure App at the moment offers fairly basic functionality and only covers certain resources even at this level. It's not going to replace the web portal or command line as your day to day tool for using Azure. That said, as a tool for doing something quick while you are out and about, for the resources it supports, it is a nice tool. I have already found it has saved me some time when I forgot to turn off a VM or quickly needed to restart a web app. Hopefully, over time, more features will be added, and the Cloud Shell part should help with this.